How does the Lyme bacteria travel from the bloodstream to other tissues? While we have known for a long time that the Lyme spirochetes can show up in the brain, eyes, joints, skin, spleen, liver, GI tract, bladder, and other organs, we didn't understand the mechanism by which it could travel through capillaries, and cell membranes. Then Dr. Mark Klempner, M.D. presented at the 1996 LDF International Lyme Conference an interesting paper that gave us part of the answer. Many researchers have observed that the Lyme spirochete attaches to the human cells tip first. It then wiggles and squirms until it enters the cell. What Dr. Klempner showed was that when the spirochete attached to the human host cell, it caused that cell to release digestive enzymes that would dissolve the cell and allow the spirochete to go where ever it pleases. This is very economic to the bacteria to use our own cell’s enzymes against us, because it does not need to carry the genes and enzymes around when it travels. Dr. Klempner also showed that the spirochete could enter cells such as the human fibroblast cell (the skin cell that makes scar tissue) and hide. Here the pathogen was protected from the immune system and could thrive without assault. More importantly when these Bb-fibroblast cultures were incubated with Rocephin (ceftriaxone), two thirds of the cultures still gave rise to live spirochetes after two weeks and in later experiments for more than 30 days. If we can’t kill it in a test tube at these high concentrations of Rocephin in four weeks, how can we hope to kill it in the human body? This means: The infection can enter the best tissue that is optimal for its survival. Once it gains an intracellular position, it may evade the immune system and antibiotic therapy by remaining sequestered away from these hostile environs. Another interesting observation about this bacteria is how it interacts with our body’s immune system. Dr. David Dorward of the NIH Rocky Mountain Laboratories showed that when healthy normal human B-cells were placed in a culture with live Borrelia burgdorferi, it was only a matter of moments before the spirochetes started to attach and penetrate the antibody producing white blood cells. Once inside the cell, the bacteria should be killed by a process wherein B-cell lysosomal enzymes dissolve the bacteria. But this does not happen. Instead, the bacteria actually thrive and eventually destroy the lymphocyte. What is much more disconcerting is that by using a time lapse video camera, the spirochete can be seen to enter the B-cell and exit a short distance later. But when it exits it appears to be wearing the membrane of the B-cell. 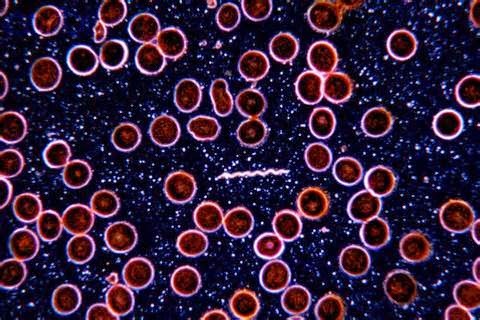 The live motile bacteria then swims about unharmed in the sea of B-cells because by wearing the cloak of its enemy, it goes undetected. This stealth type camouflage will prevent antibodies from attaching to it; it prevents the compliment enzymes in the blood from finding and destroying it; and it eludes the scavenger while blood cells such as macrophages and killer T-cells that normally hunt and destroy foreign pathogens. This means: We have a highly evolved bacteria that is highly mobile, can dissolve any tissue it desires so it can find immune privileged sites, and can camouflage itself from our own immune system by wearing the membrane of the very cells that are supposed to track it down and kill it. This bacteria seems to have evolved a sophisticated defense mechanism to avoid our immune system. The Complexities of Lyme Disease (A Microbiology Tutorial) By Thomas Grier, M.S. All I can say is WOW! I knew it was stealthy but wow. I know, Ginny. My thoughts exactly.